For us Brits ‘comfort food’ isn’t some fashionable foodie trend – it’s a necessity! As we nurse ourselves through the dark of winter and anticipate the coming of spring, hearty soups, casseroles and roasts are very much the order of the day. This is cooking for the soul as much as the body or mind, and all of the red wines recommended this month would fall into the soulful category: big-hearted, warm-blooded wines with plenty of chunky fruit, power and depth of flavour. 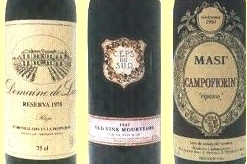 This profile suggests more rustic grape varieties like Mourvèdre or Grenache from the Southern Rhône, or the Tempranillo of Rioja. 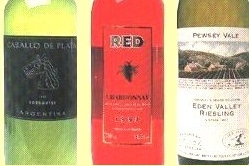 Such wines are preferred to leaner, firmer styles like most Cabernet Sauvignons for example. Whites should be fuller-bodied and savoury: perhaps lightly-oaked Chardonnay, white Rioja or Australian Marsanne. Torrontes is Argentina’s best kept wine secret. This fine example has a floral, candied nose, reminiscent of parma violets and freesias. It is lemony and fresh in the mouth with peach and plum fruit, but plenty of keen acidity to keep it sharp. Tremendous character for the money. A fun idea: it’s not the wine that’s red, but everything else including bottle and cork is a startling crimson colour! Thankfully, the stuff inside is a rather nice French chardonnay with a clean, fruity nose and a dollop of buttery oak. Dry and savoury on the palate, this would be good with Paella and other robust fish or chicken dishes. This is gorgeous stuff with attractive aromas of tropical fruit, limes and tangerine peel. It is wonderfully succulent with pear and mango fruit and a zesty citrus note. There is a sense of roundness that is missing from some other Australian rieslings with hints of fig and butterscotch in the background. Delicious. Who could resist a 20 year old Rioja for under a fiver? The nose is loaded with strawberry fruit and some toffee notes. On the palate the wine has more strawberry fruit, reasonable length and a dry, nutty finish. Majestic’s minimum purchase is one mixed case, but the good news is they now have free delivery anywhere in mainland Britain. has a nose of saddle-leather, damsons and plums. The palate displays a depth of berry fruit, raspberries and cream with a nice smoky edge. This terrific stuff is smooth, full of flavour and would be perfect with wintry dishes. has a powerful nose of raisins and stewed-fruit compote, hints of earl-grey tea and flowers. On the palate this Italian wine is surprisingly cool, smooth and pure, with ethereal flavours of rose-hips, bitter cherries, nuts and damsons. What a match it would be with a pot roast or rich casserole. One last tip: if you are making bouillabaisse or other chunky fish soups or stews, trying partnering them with a chilled Fino or Manzanilla Sherry – a magical combination.